Touhou Chireiden (Earth Spirit Palace) ~ Subterranean Animism (東方地霊殿　～ Subterranean Animism) is the eleventh official game in the Touhou Project. The trial version was released at Reitaisai 5, and the full version debuted at Comiket 74. 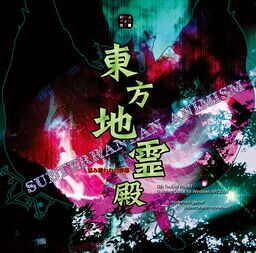 Subterranean Animism features two playable characters (Reimu Hakurei and Marisa Kirisame), each with three weapon types representing a youkai assisting them from above ground. Collecting power items adds up to four "option" satellites around the character (or eight for the Marisa/Alice combination), which behave differently according to the character and weapon type. Power can be used to unleash a bomb, each with different behaviors, and some cause special gameplay effects to occur. The scoring system is based on grazing, coupled with the collection of items dropped by enemies. As such, the player is urged to actively graze at every possible opportunity in order to increase the point item value. Grazing large amounts of bullets in little time is rewarded by the temporary effect of autocollecting all the freefalling items at their maximum value (identical to the point of collection effect, but without regard to the character's location on the screen), letting the player concentrate on avoiding bullets. ZUN has stated that the entire story was a result of his decision to use a partner system in this game, just like Imperishable Night. The partners for Reimu Hakurei and Marisa Kirisame in Imperishable Night both show up again as the first choice. A difference from other games is that you can still get good endings when finishing the game on easy mode. However, the extra stage only gets enabled after a 1cc on normal mode. Suddenly a geyser erupted out of nowhere, which Reimu Hakurei and Marisa Kirisame took advantage of, even though a higher amount of earth spirits showed up. But others got worried, and wanted them to go down into the Underworld, with a device Yukari Yakumo made so they could talk even underground. After passing the tsuchigumo Yamame Kurodani and the jealous bridge princess Parsee Mizuhashi, the heroine reaches the Former Capital, a place where now the oni live. Yuugi Hoshiguma challenges the heroine on a friendly battle, and then says the heroine should go to the Palace of the Earth Spirits. Here, the heroine met Satori Komeiji, the owner of both Rin Kaenbyou (Orin) and Utsuho Reiuji (Okuu). Rin wanted the heroine to come down and help her stop her friend as Utsuho became too powerful, and Utsuho eventually was stopped by the heroine. Afterwards, the heroine visits the Moriya Shrine to talk with Kanako Yasaka and Suwako Moriya. The goddesses were not there, but she does meet Satori's sister, Koishi Komeiji, who wanted to go to the Moriya Shrine to ask the gods to empower her pets. In the end, they have a duel because Koishi wanted to see if the person who defeated her sister was really that strong. Just like Mountain of Faith, Subterranean Animism had 18 tracks, but only 17 can be heard in the music room. The 18th track, "Player's Score" (プレイヤーズスコア), is copied over from Mountain of Faith. The title screen is just like any other title screen, an arrangement of "Theme of Eastern Story" (テーマ・オブ・イースタンストーリー) from Akyu's Untouched Score vol.5. A recurring theme in the earlier stages of the game is that it is "cave-like", with lots of echos. A couple of songs from this game have been arranged for other games and music CDs. Utsuho Reiuji's theme, "Solar Sect of Mystic Wisdom ~ Nuclear Fusion" (霊知の太陽信仰　～ Nuclear Fusion) was arranged by U2 Akiyama for Touhou Hisoutensoku. "Hartmann's Youkai Girl" (ハルトマンの妖怪少女), Koishi Komeiji's theme, was arranged by ZUN for Trojan Green Asteroid and was again rearranged in Hopeless Masquerade by U2. While you're playing, if you look at the right, you can see Reimu Hakurei written in yellow and Marisa Kirisame in green. Most of the characters that the protagonist meets think she is talking to herself at first, because the protagonist's partner is not visible. Visit the thpatch game page to find the specific patch contents for Subterranean Animism. This page was last edited on 3 February 2019, at 05:46.